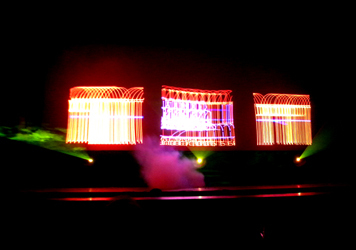 November 28, 2012, Salt Lake, Kolkata. 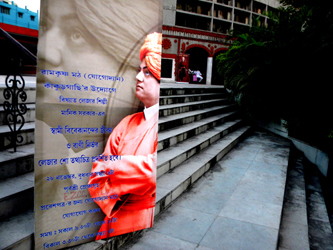 “Swamiji”, the laser documentary on Swami Vivekananda continued to win the hearts of Bengal. This time it was for the Ramakrishna Math, Yogodyan. 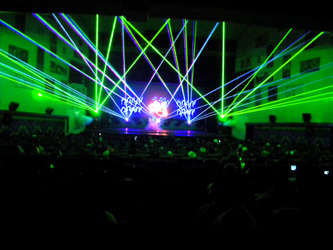 By a special arrangement, the show took place at the Purbashree Auditorium of the Govt. 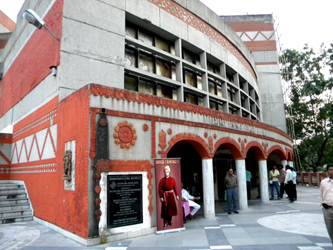 of India owned Eastern Zonal Cultural Center (EZCC) at Salt Lake. 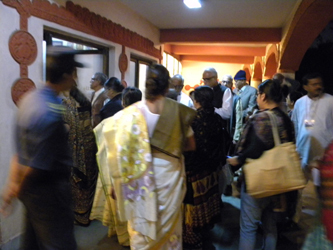 (Left) People head towards the auditorium. 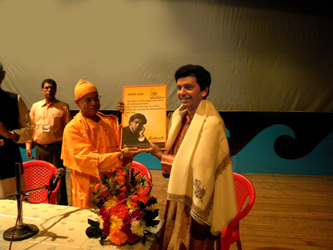 (Right) Manick Sorcar felicitated by Swami Nityamuktananda, the Head of Ramakrishna Math, Yogodyan, Kankurgachi, where he receives a bouquet of flowers, a shawl, and a Vivekananda portrait. The program started at 6 pm. Swami Nityamuktananda, the Head of Ramakrishna Math, Yogodyan, gave a welcome-speech to the unique show to celebrate the 150th birth anniversary of Swami Vivekananda. He thanked Manick Sorcar for agreeing to display the popular show and felicitated him with flowers, a shawl, and a portrait of Swami Vivekananda . “Years ago I had seen his great father’s magic show”, said Nitymuktananda ji, “today I am going to experience Manick Sorcar’s magic through the laser documentary I have heard so much about.”. 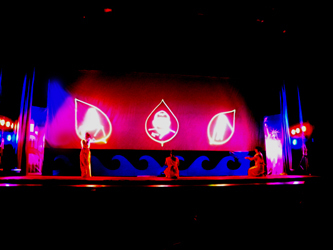 (Left) A dramatic scene from the prayer dance, where three ladies with flowers in hand pay homage to the Holy Trio. (Right) "You are a reincarnation of Lord Narayana", says Ramakrishna to Narendra. 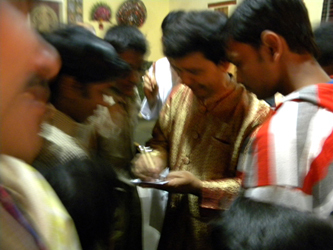 A humbled Manick Sorcar bowed down to take the monk’s blessings. 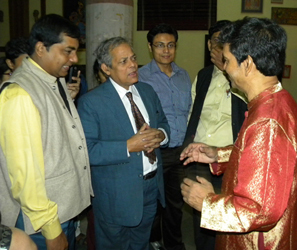 Alok Chatterjee, a retired professor of Calcutta University and an ardent devotee of Yogodyan, gave a speech on the special occasion reminding of Swami Vivekananda’s contribution to the world. After the speech he passed the microphone to Manick to take over the show, which proved to be highly successful one more time. (Left) A mind boggling scene from “Swamiji”. 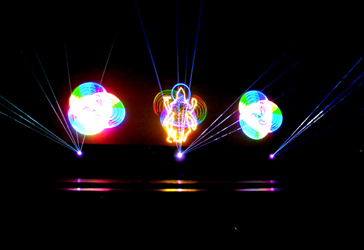 (Right) A spectacular splash of laser beams in a scene from “Swamiji”. know of him, and you brought him to life! You have done an outstanding job", said one of the spectators. 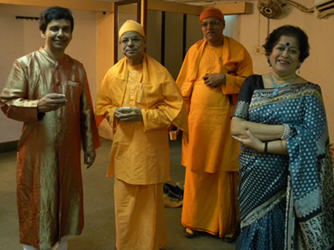 Swami Shivapremananda of Ramakrishna Math, Yogodyan, paid a visit at the green room. "Marvelous job! It indeed kept the audience spellbound", said Swami Nityamuktananda. . Note: Because of tremendous demand the show will be held at several cities in India through mid-January 2013, in addition to consecutive 10 days at Mahajati Sadan in December, and other Ramakrishna missions at metropolitan Calcutta.